Clearing and windy. High 63F. Winds WNW at 25 to 35 mph. Winds could occasionally gust over 40 mph..
You can see wind turbines in the Tehachapi Valley. A lone Gran Fondo rider on Cameron Road, with the wind turbines in the background. 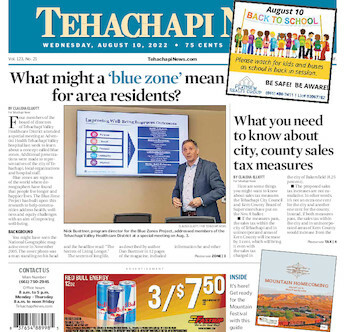 Visitor Guide: Wind development: Why Tehachapi Pass? The proximity of Tehachapi Pass to the Los Angeles Basin makes it an attractive location for wind power development, as it reduces the length, cost and environmental impact of required transmission lines. Power from numerous wind farms in the East Kern Wind Resource Area is conditioned at Southern California Edison's Windhub substation and sent south on the 500,000-volt transmission lines of Tehachapi Renewable Transmission Project to the receiving substation in Mira Loma. In California, summertime heating of the ground inland causes the air to rise, creating a thermal low — a low-pressure region. Cooler, higher-pressure air masses over the ocean move inland to fill the thermal low, flowing through mountain passes like Tehachapi Pass. The venturi effect of the mountain pass accelerates the wind to a high velocity, providing an attractive concentration of wind power resource.